Several gene mutations have been linked to Parkinson's disease, but exactly how and where some of them cause their damage has been unclear. A new Yale study, published in the Journal of Cell Biology, shows that one of the genes whose mutations are responsible for a familial form of Parkinson's encodes a protein that controls the transfer of lipids between membranes of cell organelles. The labs of Yale's Pietro De Camilli and Karin Reinisch investigated the role of VPS13 proteins whose dysfunction play a role in a variety of neurological disorders, including Parkinson's. They found that VPS13 proteins can extract lipids from cellular membranes, harbor them in a waterproof cavity, and transfer them to adjacent membranes. 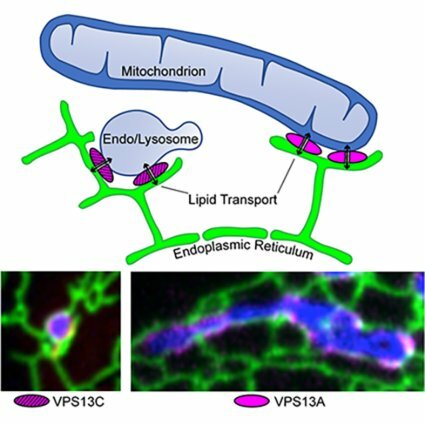 VPS13 family members are localized at sites within the cell where organelles are in close proximity to each other—so-called contact sites—and function as tethers between them making lipid transfer more efficient. VPS13 family members operate at different sites within the cell and are associated with different neurological disorders. VPS13C, the protein associated with Parkinson's disease, acts at contacts between the endoplasmic reticulum (the organelle where most lipids are synthesized) and endosomes/lysosomes (the organelles where most cell components are degraded). Another, VPS13A, is associated with a Huntington's-like syndrome (Chorea-Acanthocytosis) and acts at contacts between the endoplasmic reticulum and mitochondria, the energy centers of the cell. As other Parkinson's disease genes also encode proteins of the endo-lysosomal system, the new insight may help identify shared cellular mechanisms in Parkinson's disease resulting from mutations in different genes and thus help design new therapies for this condition, the authors say. Nikit Kumar and Marianna Leonzino of Yale are first authors of the study.